I'm so excited, I've joined the #PSPfit to help me with my road to health. 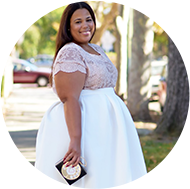 It's an awesome program put together by Cece from The Big Girl Blog and her team. It includes exercise videos, recipes, shopping lists, and so much more, but I'll let her tell you about it. I need structure, so the meal plans alone are worth it alone. She's my guest writer for the today. Take it away! #PSPfit stands for Plus Size Princess Fitness, its a social media movement for healthy curves. We believe in Health at Every Size so, if you're looking to find curvy girls who work out and cook healthy meals just click #PSPfit on instagram or #PSPfit on twitter and there we are! Having a personal trainer and nutrition coach changed my life, but it is expensive! So, I came up with an idea to bring professional nutrition and fitness coaching to curvy girls at an affordable rate. Our Pre-Thanksgiving boot camp is four weeks of nutrition and fitness coaching for women in any part of the world. This would normally cost about $1800 per month, but because of a sponsorship from Lane Bryant Active we're able to do it for $99. Do you have to live in NYC to join the boot camp? Nope! We do sessions with the coaches online and in person so we have women joining us from London, Australia, Singapore and around the united states. If you live in/near NYC you can meet us in person too! I actually just signed up... can you give me a breakdown of what I'll get? Where can I sign up? Side note: I love CeCe, she has a genuine and sincere spirit and really wants to help the next girl. I so excited for her and this awesome project. I can't wait to get started. Yay for healthy curves! I love that this project is Not geared toward weight loss but being healthy at the size you are!!!!! I really love this idea! Do they just email you after you pay? I clicked to sign up and it just sent me to Paypal. Yes, they do. That was confusing for me as well. They should send you a register link and a code.